Congressman Keith Ellison represents Minnesota’s 5th Congressional District in the U.S. House of Representatives. The Fifth District includes the City of Minneapolis and surrounding suburbs and is one of the most vibrant and ethnically diverse districts in Minnesota. Rep. Ellison’s guiding philosophy is based on “generosity and inclusion” and his priorities in Congress are building prosperity for working families, promoting peace, pursuing environmental sustainability, and advancing civil and human rights. Rep. Ellison’s commitment to consumer justice led him to write legislation that was included in the Credit Cardholder’s Bill of Rights of 2009. This law prevents an unfair practice called “universal default,” which allowed lenders to increase their customers’ interest rates if they had late payments with another lender. 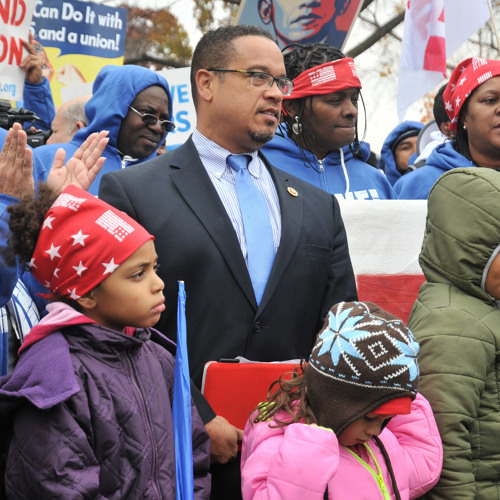 In response to the foreclosure crisis that began in 2008, Rep. Ellison also wrote the Protecting Tenants in Foreclosure Act, which requires banks and other new owners to provide at least 90 days’ notice of eviction to renters occupying foreclosed homes. As a member of the House Financial Services Committee, the congressman helps oversee the nation’s financial services and housing industries, as well as Wall Street. He also serves on the House Democratic Steering & Policy Committee, which decides committee assignments for Democratic Members and sets the Democratic Caucus' policy agenda. In the past he served on the House Judiciary Committee and the House Committee on Foreign Affairs. Rep. Ellison was elected co-chair of the Congressional Progressive Caucus for the 113th Congress that promotes the progressive promise of fairness for all. He is also a member of the Congressional Black Caucus, founded the Congressional Consumer Justice Caucus, and belongs to more than a dozen other caucuses that focus on issues ranging from social inclusion to environmental protection. Before being elected to Congress Rep. Ellison was a noted community activist and ran a thriving civil rights, employment, and criminal defense law practice in Minneapolis. He also was elected to serve two terms in the Minnesota State House of Representatives. Keith was born and raised in Detroit, Michigan. He has lived in Minnesota since earning his law degree from the University of Minnesota Law School in 1990. Keith is the proud father of four children.